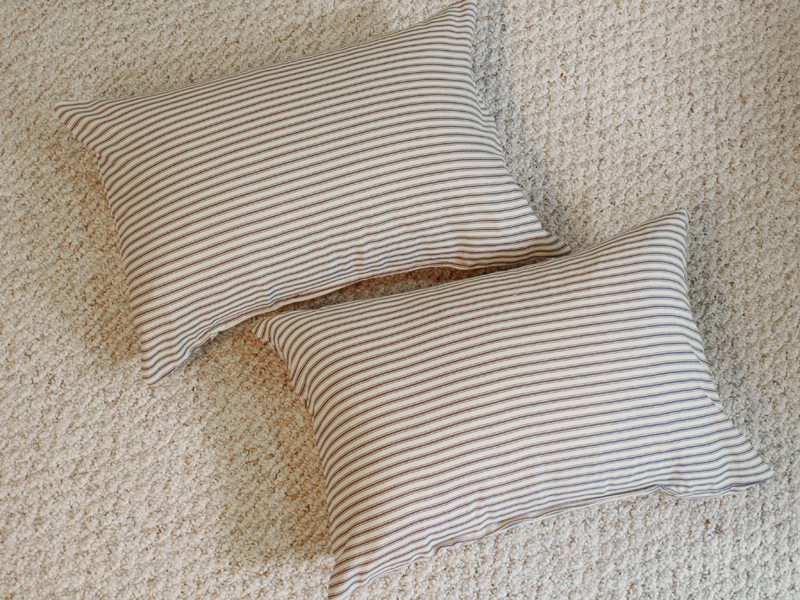 As I mentioned yesterday, I’ve got a growing list of projects I’d like to do with ticking stripe, but the first are a couple of pillow designs. 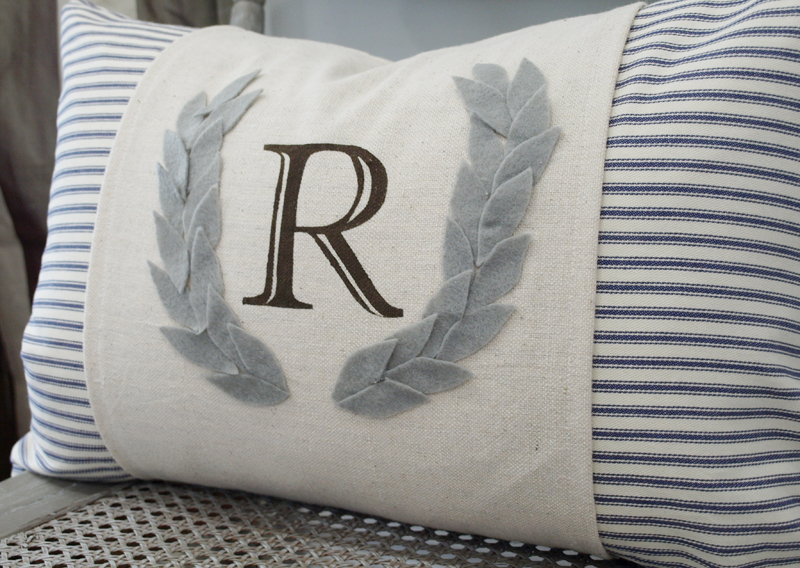 Remember this one I did for the guest room last month? Well, I couldn’t resist doing some more for a couple new chairs in my dining room. 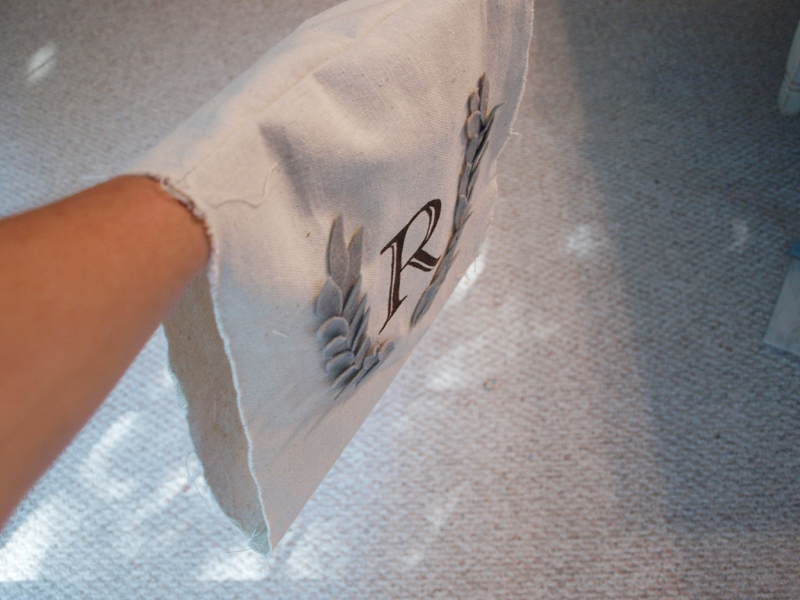 I used a similar technique with the ticking pillow and a canvas “sleeve”, once again using my favorite freezer paper stenciling method. 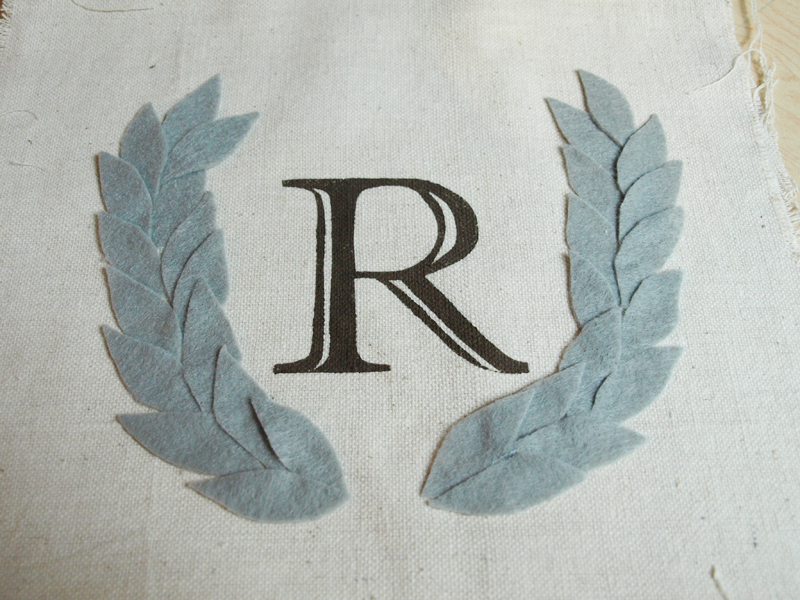 And then I added the laurel wreath for just a little more interest. 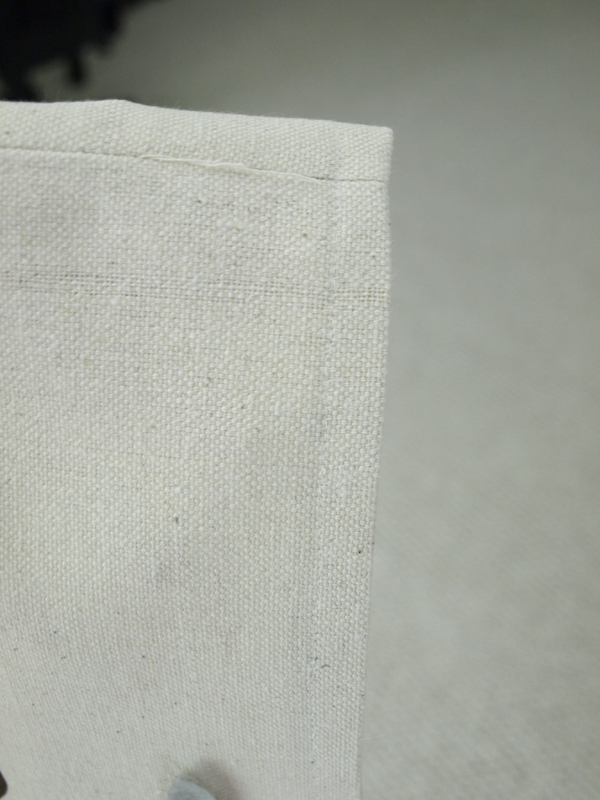 Then, I cut 4 pieces of canvas drop cloth to the same length as the pillow measurement from top to bottom, adding 1/2 inch for seam allowance. 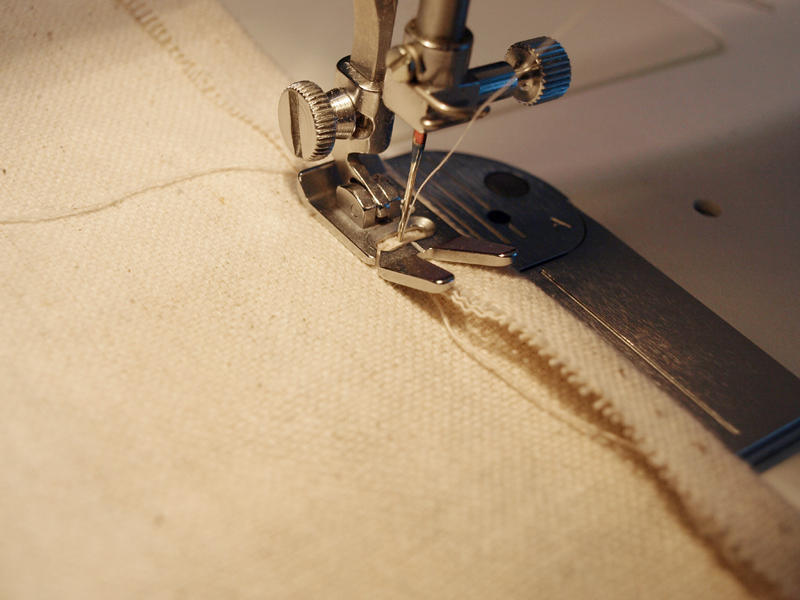 I cut the width to around half the width of the pillow. 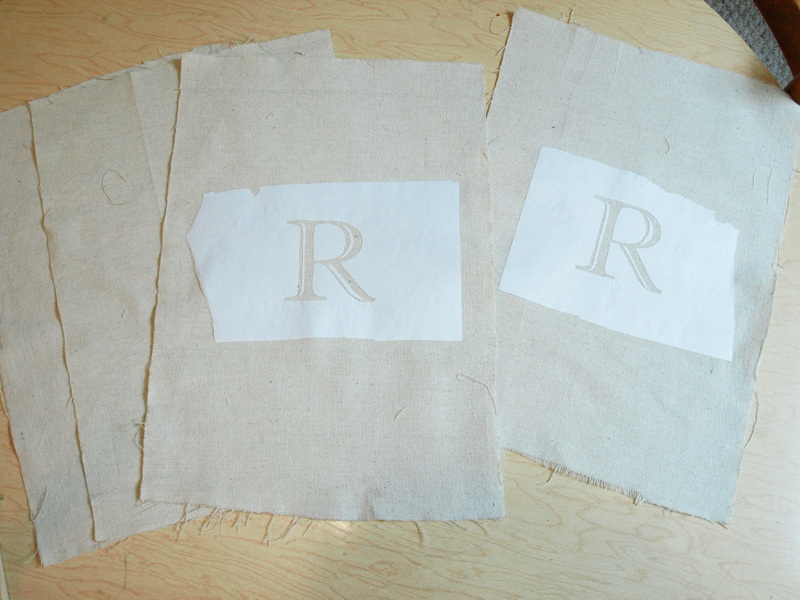 Then, I painted on the “R”s using the freezer paper. 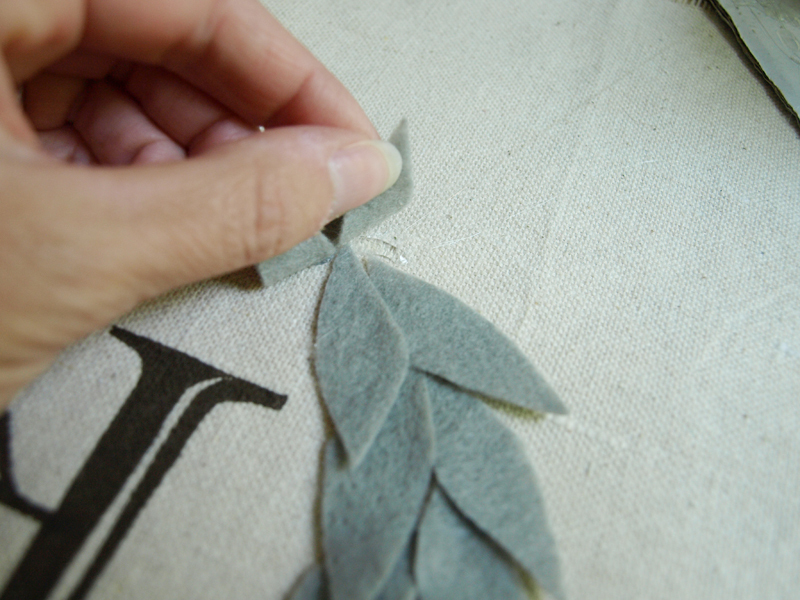 Then, I drew a partial circle with a light pencil mark to make a guideline for the wreath. Using a basic sheet of gray felt from Hobby Lobby, I cut out the leaves for the wreath, just like I did for this pillow last year. Then, I placed the leaves how I wanted them, and glued them in place with my hot glue gun. Once the leaves were in place, I sewed the sleeve together at the top and bottom, then tried it on the pillow to see if it was a good fit. 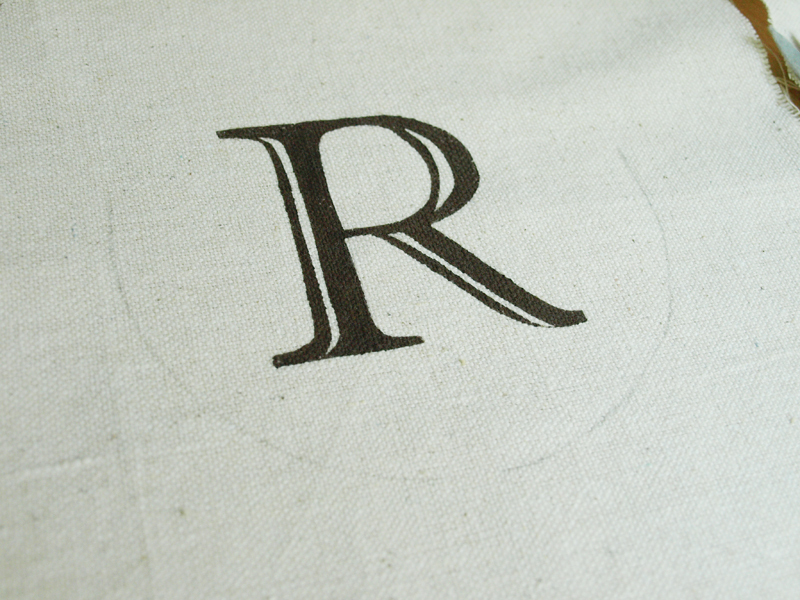 Then, I just had to fold under the raw edges and sew. 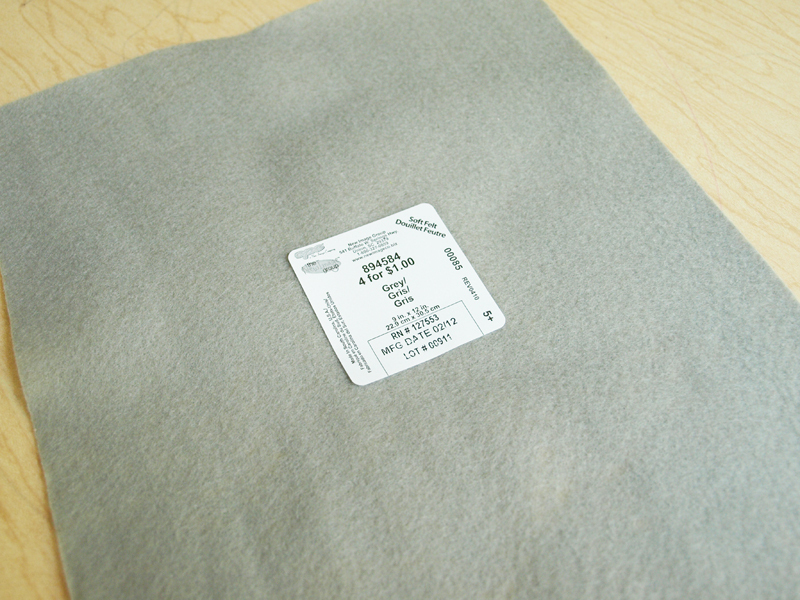 The sleeve fits snugly over the middle of the pillow, leaving just the right amount of the ticking showing through on each side. They’re just right on my two new chairs I just made over for the dining room. Stay tuned and I’ll show you how those turned out in a couple days! This entry was posted in Uncategorized and tagged Canvas Drop Cloth, Dining Room, Freezer Paper Stencils, Pillows, Sewing, Ticking Stripe. Bookmark the permalink. Follow any comments here with the RSS feed for this post. Post a comment or leave a trackback: Trackback URL. What a wonderful project! So clever and fresh looking! Very pretty, Julie! Love the sleeve idea. Ha, I'm totally in love with ticking, too! As you can probably tell from the pillow in my little avatar picture 🙂 That's one of my favorite items in my whole Etsy shop (click my link if you want to see it close up! 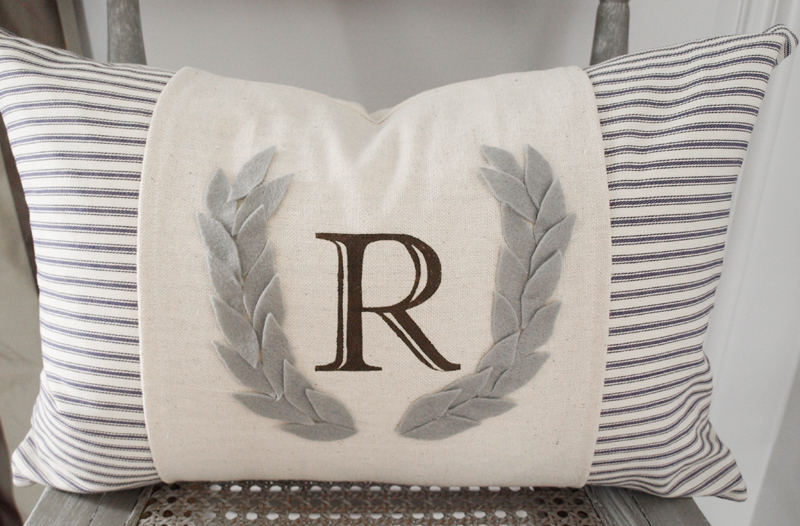 https://www.etsy.com/listing/99392650/ruffled-blue-ticking-stripe-pillow-cover). I have several ticking items in the shop, actually. Yaaaay for ticking!! I love that you made a sleeve for your pillow from the fabric rather than covering the entire pillow, the contrast with the ticking is fantastic. Thanks for sharing.